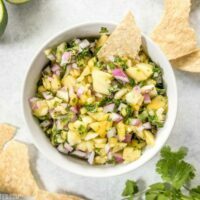 This easy pineapple salsa is fresh, vibrant, and perfect for chips, piling onto grilled meats, or even topping salads. Chop the pineapple into small pieces. If using canned pineapple, make sure to drain it well before chopping. You can save the juice for smoothies, marinades, or other uses. Place the chopped pineapple in a bowl. Finely dice the red onion and add it to the bowl. Remove the seeds from the jalapeño by first cutting off the stem, then cutting the pepper in half length-wise. Scrape the seeds out with a spoon and then finely dice the remaining pepper. Add the jalapeño to the bowl. Wash and shake off as much water from the cilantro as possible. Remove the leaves from the stems and roughly chop them. Add the chopped cilantro to the bowl. Squeeze the juice of one lime into the bowl. Stir everything together. Add salt to your liking. Start with 1/2 tsp, stir it in, taste it and then add more as needed. I used 1 teaspoon total. Keep the salsa refrigerated until ready to eat. Stir to redistribute juices and flavor before serving. *Or one 20oz. can pineapple tidbits packed in juice, drained.